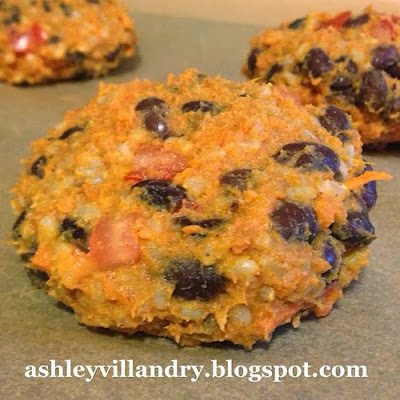 The Healthy Life: Southwest Veggie Burgers! First, set the rice to cook following the recipe on the package but without adding oil, butter, or salt. I use 365 organic short grain brown rice and cook with just water and it works perfectly. Once the rice is cooking, begin to boil the water to cook the sweet potato. Peel and cube the sweet potato and once the water is boiling, add potato, reduce heat to medium and cook until softened. While rice and potato cook, drain and rinse beans, and place them onto a paper towel and gently pat dry and set aside. Dice the tomato, shred the carrot, and add to a large mixing bowl along with the beans, spices, and nutritional yeast. Once the potato is cooked, strain and mash thoroughly. Keep potato separate while the rice finishes cooking so that it will cool. Once the rice is finished, allow to cool slightly and add to mixture along with sweet potato. Once all ingredients are in the mixing bowl, gently mix them so that they are spread evenly throughout and then begin to form tight patties. If the mixture is warm, allow to sit until it cools or briefly place it in the refrigerator. The cooler it is, the more tightly the patties will form. This mixture makes 4 large patties, or 6-8 smaller sliders. Place each patty on a baking sheet covered with parchment paper and cook on each side for 15-20 min, or until top is a light brown. Serve on an organic whole wheat bun with your favorite burger toppings. For this recipe, I love to top with with guacamole, some sliced tomato, and lettuce. Goes great with a small mixed greens salad! Healthy Life Tip: Save the extra patties or double the recipe for an easy meal at a later date by freezing patties once they have been cooked and cooled off! 225 cal, 2.1g fat, 0.06g sat fat, 0g trans fat, 0mg cholesterol, 72mg sodium, 46g carbohydrates, 9.3g fiber, 6.8g sugar, 9.7g protein. For an added 16g protein, add 2 tablespoons of this Cookable Protein Powder.